Space Exploration Technologies (SpaceX) has, after a number of delays, one of the company’s Falcon 9 v1.1 boosters ready to carry out the Commercial Resupply 3 (CRS-3) mission. Launch is currently slated to take place from Cape Canaveral Air Force Station’s Space Launch Complex 40 (SLC-40) in Florida at 4:58 p.m. EDT (2058 GMT) tomorrow, April 14. CRS-3 is a resupply mission which will deliver cargo and other supplies to the International Space Station (ISS). This oft-delayed mission has slipped no fewer than six times – with the threat of a further delay looming over the mission today. 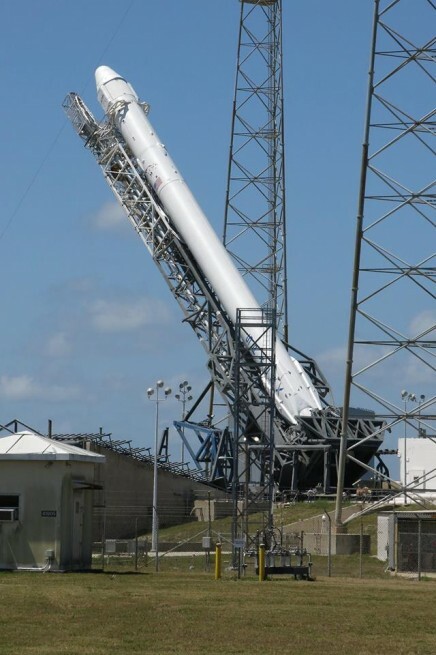 NASA and their counterparts weighed the risk and have now deemed the launch vehicle and station ready for the flight. Monday’s launch had been placed temporarily in jeopardy due to a malfunctioning External Multiplexer-Demultiplexer (MDM) or “EXT-2″ component on the outside of the space station. According to a report appearing in the LA Times, this component, essentially a backup computer system which controls many of the functions on the “inboard” portion of the station’s truss segment – including the radiators, the mobile transporter, the thermal cooling system, the Alpha Solar Array itself and numerous other elements – was down. The primary computer is, according to NASA, working “flawlessly” – the problem surrounds the backup computer which would be used in the event of an problem with the primary system. In order to repair the computer, Expedition 39 crew members would need to perform an extra-vehicular activity (EVA) – something which, to date, has not been scheduled. In fact NASA is currently determining which crew members would carry out this EVA. If everything goes according to plan, the Dragon spacecraft will be captured by the station’s Canadarm 2 and berthed to the orbiting laboratory – at least that is what would occur under normal conditions. From left-to-right, NASA’s Mike Curie. Hans Koenigsmann with SpaceX and Mike McAleenan the Launch Weather Officer for the 45th Space Wing (Credits: Jason Rhian / SpaceFlight Insider). NASA had determined on Saturday that it needed the material to repair the MDM and contacted Boeing – who in turn contacted Honeywell to get the needed part on board Dragon in time for tomorrow’s launch. This was a late stow, one necessitated by this failure. The solar array will be placed into a “safe” position so that Dragon can be berthed to the ISS. NASA has a wide-range of cargo on board the station which includes components for space suits, new suits, “space legs” for Robonaut 2, and a variety of other parts and components. This is the latest wrinkle in an effort to launch the third of twelve planned cargo resupply missions to the International Space Station. The mission has been delayed some ten times, for a variety of issues. Radar outtages, contaminated skirts and a variety of other hiccups have caused the mission to be repeatedly pushed back. 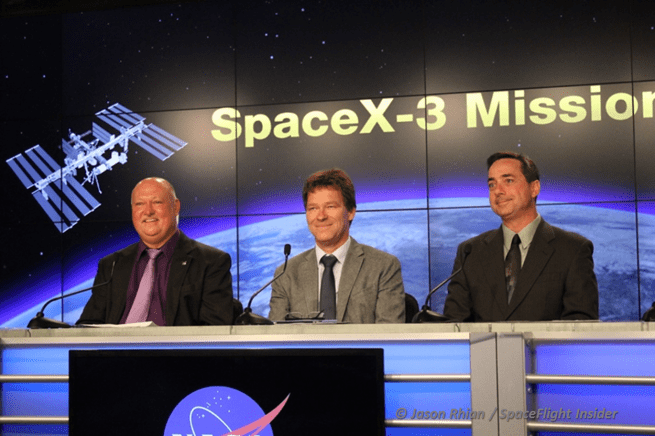 During the April 13 conference Suffredini highlighted that the station is in need of the supplies that Dragon will carry aloft. “We’ve been slipping a little to the ‘right’ (in terms of launching this mission) as we’ve been consuming our resources on board…” Suffredini said. This is a very unique mission for a variety of reasons. Not the least of which is SpaceX’s effort to test out “landing legs” which are connected to the Falcon 9′s first stage. SpaceX is hopeful that if things go as advertised the Hawthorne, California-based company could see their current primary launch vehicle go from expendable – to reusable. This could serve to revolutionize how missions to orbit are conducted and force SpaceX’s rivals to compete with a launch service provider that can offer orbital services – at a much lower cost. Koenigsmann went on to detail when Dragon should arrive at the ISS. The rocket’s first stage will fire additional thrusters from these legs after it disconnects with the rest of the launch vehicle, and attempt to allow for controlled flight and re-entry without breaking up in the atmosphere. SpaceX has stated that having its Falcon 9 be reusable would see an increase in jobs in the hard-hit Space Coast area. However, SpaceX has stated in the past that its presence would provide much-needed jobs to the region – something which, to date, has not materialized. Ever since the Obama Administration cancelled the follow-on to the shuttle program, Constellation, the Space Coast has been incredibly hard hit and has not recovered as quickly as other areas of the nation post-recession. NASA and SpaceX conducted a late stow of the Dragon capsule with components needed to address the failure of the MDM (Credits: John Studwell / SpaceFlight Insider). NASA awarded the CRS contract to SpaceX in 2008 during the Bush Administration. Under this agreement, SpaceX is tasked with carrying out 12 resupply missions to the ISS. SpaceX currently has over 50 launches for both governments, as well as private companies on its manifest that has been valued at more than $5 billion. When launched, SpaceX CRS-3 will carry around 4,600 pounds of supply and payload that includes materials to support more than 150 investigations by Expedition 39 and 40 crewmembers on the ISS. One of the major components on this mission will involve space-based laser communication with the Optical Payload for Lasercomm Science (OPALS) experiment. This scientific instrument will transfer video signals from the ISS to a ground receiver at JPL’s Optical Communications Telescope Laboratory (OCTL) in Wrightwood, California, which will test a next-generation optical communication system that will allow enhanced levels of data transfer speeds than what is currently available with standard radio waves. Also being delivered by CRS-3 will be the Vegetable Production System (VEGGIE) intended to supply needed and reusable sources of fresh foods to aid long duration space missions. Root mats loaded with a variety of seeds will be grown with water, light, and carbon dioxide that is maintained by the ISS cabin environment, in a device that will also provide the largest volume available for growing plants ever on the ISS. Another science experiment that will involve the study of ISS crew’s health and well being is the T-Cell Activation in Aging (T-Cell Act in Aging) experiment. NASA in conjunction with the National Institute on Aging (NIA) plan to study isolated T-cells flown on CRS-3 to determine the effect micro gravity has on the human immune system, and find the causes of enhance deterioration of white blood cells that hinder crewmembers ability to fight infections during and after time spent in space. This is a well-documented problem throughout the history of manned space flight, and it’s vital to find reasonable solutions for this issue that will ultimately aid with planned long-duration missions in and beyond LEO. The High Definition Earth Viewing (HDVE) experiment will also test a variety of high definition cameras attached to the exterior of the ISS. These cameras are made of different designs and use multiple operation modes that will look to determine which configuration can provide the best live-streaming video signal to send back to Earth, and also withstand the extreme temperature changes and radiation in the vacuum of space. This will also be the first time SpaceX will launch four powered cargo payloads in Dragon’s pressured section along with two other cargo payloads in the unpressurized trunk of the spacecraft. After rendezvousing with the ISS, Dragon should stay connected up to four weeks before making its return to Earth. Upon reentry, the Dragon spacecraft should return with 3,600 pounds of cargo including science equipment, station hardware, crew supplies, and other biotechnology.